As first appeared on the CNY Observers & Observing website, www.cnyo.org, on 22 June 2013. As if NEAF wasn’t already an excellent first showing for Ryan (and Heather!) Goodson and New Moon Telescopes (including discussions at Cloudy Nights (link 1, link 2) and a recorded observation in Sky & Telescope in this month’s issue), I am pleased to provide a full copy of the result of their first NEAF meeting with Gary Parkerson, Managing Editor of Astronomy Technology Today (www.astronomytechnologytoday.com): A feature (and cover) article (by yours truly) giving the NMT 16″ f/4.5 Dobsonian a complete walk-through in the May-June 2013 issue. Before anything else – I’d like to personally thank Gary and all at ATT for providing a platform for my review of the NMT scope, their continued support of other amateur astronomers through many years of excellent equipment reviews, and their complete coolness with allowing CNYO to repost the complete article for your viewing pleasure. 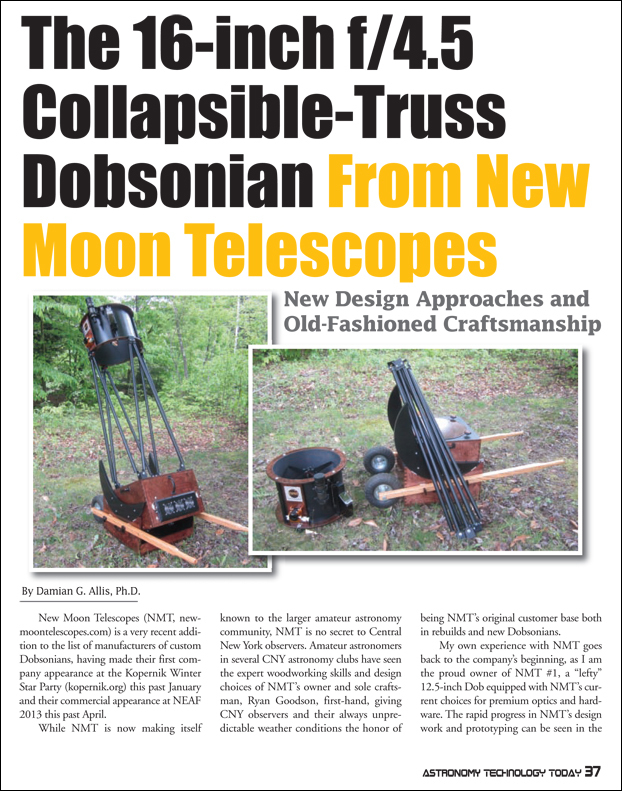 New Moon Telescopes (NMT, newmoontelescopes.com) is a very recent addition to the list of manufacturers of custom Dobsonians, having made their first company appearance at the Kopernik Winter Star Party (kopernik.org) this past January and their commercial appearance at NEAF 2013 this past April. While NMT is now making itself known to the larger amateur astronomy community, NMT is no secret to Central New York observers. Amateur astronomers in several CNY astronomy clubs have seen the expert woodworking skills and design choices of NMT’s owner and sole craftsman, Ryan Goodson, first-hand, giving CNY observers and their always unpredictable weather conditions the honor of being NMT’s original customer base both in rebuilds and new Dobsonians. The article introduction is no joke! There are three NMT Dobs owned just by CNYO session hosts alone (Larry S, Dan W, and myself), not counting whatever Ryan brings to our observing sessions, then several additional just in the CNY area (one CNY customer’s beautiful 18″ Dob having been on display at NEAF). I remember just within the past ten years when SCTs and fancy mounts seemed to rule the observing grounds at Darling Hill Observatory, now all of the sessions I attend are populated by light buckets. The GOTO is increasingly being superseded in favor of memorization. I say excellent! As a point of discussion in the article, I make reference to Ryan’s high-end component choices (the MoonLite focuser being high on the list – my “Ruby” (NMT #1) is named for its red focuser). I spent an extra block of time discussing the merits of a primary mirror purchase from John Lightholder at Lightholder Premium Optics. Just as I have seen many an amateur astronomer start with seemingly decent eyepieces, then eventually sell and buy their way up to TeleVue (my personal bias, anyway), I have heard too many stories of observers with primary mirrors that eventually have their faults found out over the course of many observing sessions (the primary mirrors, that is). The solution, while not cheap, is simple – start with the best you can get and never, ever, find yourself regretting an “intermediate” purchase when you go to finally take the plunge on a high-quality primary. The mirror alone cost more than many of the major vendors are currently charging for complete-and-shipped 12-inch Dobsonian telescopes. The reason is simple – it is absolutely worth it. The Goodsons’ telescopes captured my attention, as did the Goodsons themselves, for the simple reason that they represent one of the aspects I love most about the telescope industry. Astronomy enthusiasts are primarily served by what are essentially cottage enterprises, populated with business people and craftsmen for whom their astro products and services represent labors of love. Most are family businesses, as is ATT, a fact that is reinforced with each trip to NEAF as I am privileged to again greet in person the family partnerships who gather there each year. I am grateful to Gary and ATT for allowing us to repost the complete article on the CNYO website (and this pruned version of the issue was generated from the PDF I obtained as an enlightened subscriber to the digital version of ATT). It remains an excellent source of information from real users of equipment, a kind of completeness of analysis and discussion many of us had the pleasure of experiencing during discussions with Stu Forster and still have the pleasure of experiencing with my favorite local scope-sage Bob Piekiel. And why yes, now that you mention it, it is easy to subscribe to ATT today! Click on the image below for more info!